In the interest of disclosure, I should admit up front that I am unquestionably biased when it comes to my fondness for the Beowulf Epic. I have studied it extensively, been inspired by it, and taught it as well. It’s a powerful story, and I am convinced it will continue to be told for the next 1,000 years — in song, in prose, in poetry, in art, and on the silver screen, too. But you probably want to know what I actually thought of the movie. Here again, I need to disclose that I rarely view contemporary adaptations of great ancient works (Homer’s epics, Beowulf, Arthurian Legend, etc.) as simply “good” or “bad” in their own right, but rather as mirrors that reflect society’s current values, trends, and beliefs. This version of Beowulf does have some significant departures from the original epic, which I’m sure will be a source of ire for purists. Nevertheless, I think they were effective changes, and shed much light on our own times and struggles. The dominant theme of this film is that “Pride is the curse.” Grendel’s mother (Angelina Jolie) is transformed from a monstrous sea-hag to a seductive enchantress, who offers a to fulfill the glory-dreams of both Beowulf and Hrothgar before him — a Faustian deal which eventually costs each his life, soul, and happiness. All they have to do is sleep with her (what Nordic warrior wouldn’t take up that offer?). But the “seed” of their sin becomes the curse that comes back to haunt each one — for Hrothgar, Grendel, and for Beowulf, the Dragon. I think this is a timely message for Americans today — we have slept with the Goddess of power, wealth, and fame. What offspring of our poor choices lurks in the future to claim its revenge? There are many possible answers to that question, of course, ranging from environmental to spiritual, to economic. At one point in the film, an old man (whose family has been burned alive by the dragon) yells over and over to an aging Beowulf, “The sins of the father, the sins of the father!” This is an interesting concept (sins of the father visited upon the children) that shows up several places in the Bible, but also in Euripides’ Phrixus, Horace’s Odes, and Shakespeare’s Merchant of Venice. 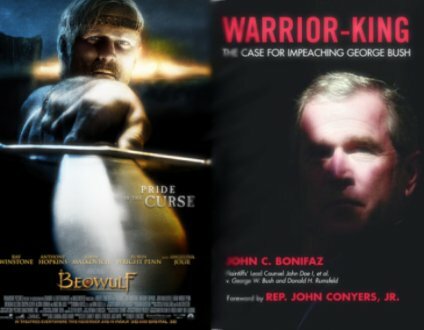 As I watched old King Hrothgar (Anthony Hopkins) say to young Beowulf, “She’s not my curse anymore…” I couldn’t help but think of George Bush the elder, his son George W. Bush, and their wars in the Middle East. Both Bushes surged in the polls when they took on the mantle of “War-time President.” Fame. Approval. Oil-Wealth. But what monsters did each create in the process? Was 9/11 the offspring of the father coming back to claim the son? Did the son “defeat” the monster, only to sleep with the goddess and create a greater one in its place? Both the original Beowulf epic and the film end on a note of uncertainty and fear for the future — the monsters are slain, but so are the heroes. In the epic, invaders from other lands stand poised to wipe out the leaderless survivors. But in the movie, the threat is more insidious: The forces that created the monsters remain. Will they fall prey to the same lust for power, wealth, and fame all over again? In exactly one year, America crowns a new king. Will we? I think your analogy about Bush 41 and Bush 43 as it relates to Beowulf is a little flawed. I certainly don’t see where you can apply the “sins of the father” mantle to the Gulf War during Bush 41’s administration. The action taken in the Middle East during the Gulf War had a very specific purpose, which was to cast Hussein from Kuwait. This mission wasn’t just undertaken by Bush 41 and a couple allies. It was a worldwide effort. After the Iraqi army was cast from Kuwait, Bush 41 was roundly criticized for not marching all the way to Baghdad and taking Saddam down. However, he and the rest of the coalition showed restraint, knowing that such a move was not the purpose of the Gulf War. My point is that the Gulf War was a measured response to an actualized threat. The second war in Iraq doesn’t meet those criteria and I believe even the most ardent war supporter now has to come to grips with the fact that this war was ill-advised at best based on the evidence at the time. However, to suggest that it is somehow related to Bush 41’s “sins” is a little much, given the vastly different reasons for the first Gulf War. Trait — I hope you didn’t take too much offense at the analogy. All analogies are a stretch, as my friend Annie points out, and this one is no exception. My brother Jeff (who is no fan of GW Bush) pointed it out too. Please know that I actually have a lot of respect for Bush I, especially after reading his “life in letters” book. The post was intended to be of an exploratory nature rather than an accusatory one, hence the question, “Was 9/11 the offspring of the father coming back to claim the son? Did the son “defeat” the monster, only to sleep with the goddess and create a greater one in its place? I am starting to question whether there is any such thing as a “just” war, but that’s an entirely different subject for debate. Regardless of whether or not the first Iraq war was “just,” wars are violent, and have consequences for both the victor and the vanquished. Wars may rescue or protect some, while creating significant ill-will among other segments of the population. Wars create both new political paradigms and political vaccums. The effects of a war are difficult to anticipate, difficult to control, and sometimes even difficult to analyze in hindsight. But wars always have consequences, even for presidents who (justly or unjustly) authorize and lead them. My question is simply this: Is it possible that in some way (psychological, political, emotional, etc.) the first war (and the first Bush) influenced the second?